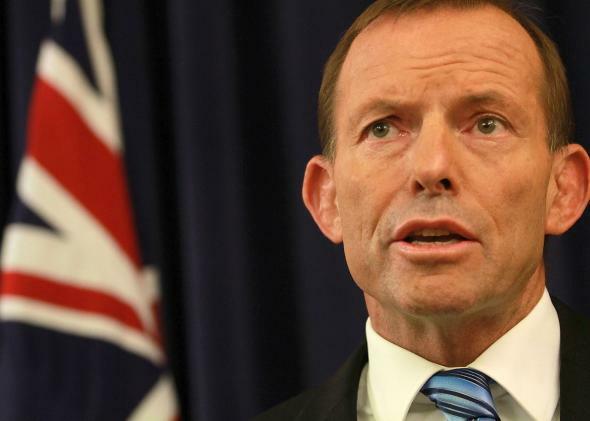 Australia's carbon tax repeal could have worldwide ramifications. Carbon-tax destroyer and Australian Prime Minister Tony Abbot. In Australia, as the Simpsons joke goes, the water goes down the toilet counterclockwise. Now, with its government voting to repeal the country’s tax on carbon—in the process killing its most significant means of reducing greenhouse gas emissions—it seems that Australia’s new prime minister, Tony Abbott, is determined to take the country in that same direction. That is, backward, down the proverbial drain of a warming planet. Australia, the industrial world’s biggest polluter per capita, was hailed as a leader on climate change action in 2011, when it passed a bill putting a price on carbon and requiring about 350 of its companies to pay a penalty for their greenhouse gas emissions. Brought in under the former prime minister, Julia Gillard, the tax would have raised 25 Australian dollars ($23.44) per ton from some of Australia’s biggest polluters, and was the country’s most significant step toward using the market as a means of reducing emissions in line with its international and domestic obligations to reach 5 percent below levels recorded in 2000 by 2020. And it looked like it was working—studies showed that there was 9 percent drop in emissions from electricity generators during the first six months of carbon pricing. Abbott had the support of a large portion of Australia’s business community, including the coal, natural gas, and airline industries. They characterized the tax as an unfair burden on Australia’s economy and businesses, especially given that the rest of the developed world was, for the most part, still just discussing a similar levy on their own polluters. A recent study from the World Bank Group and ECOFYS showed that around 40 countries are putting a price on carbon. As Lenore Taylor noted in the Guardian on Thursday, the repeal, which barely made it through the Senate, leaves Australia with nary a hint of any active climate change policy. Abbott’s alternative proposal, Direct Action is barely a band aid, and an expensive one at that: It proposes to hand out grants to businesses volunteering to reduce their emissions. Even if Direct Action gets through Parliament, it will cost more than the carbon tax—and as Taylor argues, it will put the cost on the Australian taxpayer, rather than big polluting businesses. The repeal may also do damage beyond setting the agenda back within Australia. As the Wall Street Journal pointed out, that same World Bank report called Australia’s moves to repeal a significant threat to efforts to roll out similar programs around the world, and sets the country on a collision course with Europe and other partners, including the United States, which are taking step to introduce their own carbon tax schemes. The European Union regrets the repeal of Australia’s carbon pricing mechanism just as new carbon pricing initiatives are emerging all around the world. The EU is convinced that pricing carbon is not only the most cost-effective way to reduce emissions, but also THE tool to make the economic paradigm shift the world needs. As someone who has to live in the quickly cooking world Abbott leaves behind, I can take small comfort in the fact that history will not be kind to Abbott and his ilk. With the majority of its population clinging to the coast of a country already marked by brutal drought, bushfires, and storms, Abbott should hope the Australian voters use the negligible savings generated by the carbon-tax repeal to buy a life-raft for when the waters inevitably rise.